Try our alternative breakfast cakes for a healthy start to your day. 1Peel and quarter the potatoes. Then boil them until slightly soft but still slightly firm. Leave them to cool and then grate into mixing bowl. 2Thinly slice the spring onions and add them to the potato along with the plain flour, salt and pepper and half of the butter. 3Divide into four balls and press flat into patties. Cover and leave in the fridge overnight or for as long as possible. 4Heat a frying pan and melt the butter. Fry the potato cakes for 5- 10 minutes on each side but keep a close eye that they don’t burn. 5While the cakes are cooking boil some water on the hob with a splash of cider vinegar. Once boiling take off the heat and gently add the eggs, keep the pan off the heat and place the lid on for a further 4 minutes or until the eggs are poached. Remove from water with a slotted spoon and dry on some kitchen roll. 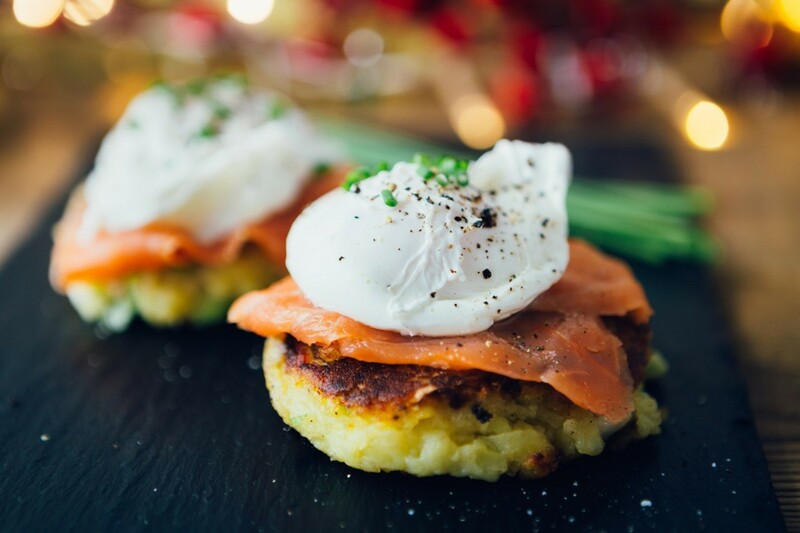 6Place the cooked potato cakes onto a plate and top with the salmon, then top the salmon with the poached eggs. Chop the chives thinly and sprinkle over the top and season with salt and pepper.